Huh, I didn’t know that. One of the nicest things a student would say to the teacher in me was, “Huh, I didn’t know that.” It’s also one of the nicest things the learner in me says to myself. I love to learn. Learning is my passion. But the “Huh” moment is more than just learning, it is correcting a misimpression or misinformation or filling in a gap. So, I was very happy when I had a “Huh” moment last night. I was watching a recording of the CBS News program, “Sunday Morning” in a vain attempt to avoid watching the Oscars. Vain attempt because this edition of the show was all about the Oscars. “Sunday Morning” has a segment called Milepost in which they briefly review an event that happened on the day sometime in the past. Last night, Milepost was about how leap years came to be as they are now. I thought I knew all about. Yeah, yeah, Earth orbit is 365.25 days. Leap year fixes that. That’s what the Roman’s thought too, hence the Julian calendar. Well, not exactly. I knew the church switched from the Julian calendar, but was fuzzy on why. Turns out the orbit isn’t exactly 365.25 and that the fix the Roman’s made was off just enough that over time the calendar stopped matching the seasons. Enter Pope Gregory XIII. He wasn’t happy about the mismatch and applying more accurate orbital measurements came up with the Gregorian calendar which allowed for leap years every four years except century years not evenly divisible by 400. Very smart guy that Gregory. The fix is still working. My only complaint about leap years is that they are also Presidential election years. This is one election campaign year I would like to be shorter, not longer. Uh huh. Author mastoutPosted on February 29, 2016 March 1, 2016 Categories UncategorizedTags Leap Year, learning, Presidential campaignLeave a comment on Huh, I didn’t know that. My father instilled in me the idea that no matter what I did, it could be improved upon. The outward sign of this psychological scar is that I am drawn to self-improvement books and articles. As I’ve aged, I’ve become less susceptible to wholesale reconstruction of some aspect of my being. Still, every so often, my father reaches up out of his grave, taps me on the shoulder and says, “Read this and do better” “5 Simple Ways to Raise Perfect Children”, you bet. “The Liver and Onions Diet”, worth a try. “Clean You Whole House in 10 Minutes”, who wouldn’t want to? You get the idea. So, when The Life Changing Magic of Tidying Up by Marie Kondo became a best seller, I had to see what I was missing. Maybe in my case the magic would be no longer sensing my father’s scowl. I checked the book out of the library and started reading. I dismissed some of her suggestions as not pertinent. Others, I took under advisement. I didn’t toss out everything in the house that didn’t “spark joy” as she put it. That would have been wasteful. My father would not be pleased. I kept reading. A few years ago, I retired. Since then, we moved from Wyoming to North Carolina, then finally, back west to Albuquerque. I ended up with a lot of clothes I no longer wore. Every time I walked into the closet or opened a dresser drawer, I could feel my father’s disapproval. Ever ready to improve, I ruthlessly filled bags for Goodwill with work clothing I would never wear again and with clothes I still liked, but were too heavy for the Southwestern climate. I made good progress until I got to the dresser drawers full of tee shirts. I loved them all. They reminded me of places I’d been and events I’d participated in. They all sparked joy, even the faded out holey ones I no longer wore. It dawned on me that Marie had the answer. Following her instructions for tee shirt storage, I folded and folded and carefully placed the shirts in the drawer. When I finished, I had reduced the space required for storage to one drawer which now held precisely 24 tee shirts placed on end like books with their spines up. I haven’t heard from my father since. You’ll remember that the idea behind this project was to take a picture a day for a year. That idea hasn’t worked out as well as I had hoped. I have missed quite a few days and we are only about two months in. I haven’t given up. I have several pictures which need to be posted. I’ll post them then we’ll see what happens. It’s been so long since I took this, I couldn’t remember why. Now I do. It’s a picture of the house immediately south of our kitchen. This is the view from our patio door. The both of the half moon windows had blinds on them until yesterday. For some reason the blinds have been taken down. This is a problem because the window on the right is in the master bedroom. We can see right in now. We don’t want to. The tiny speck on the top of the highest rock is a bird. As I was walking by this pile of rocks, I heard a bird call I didn’t know. I figured out it was coming from this bird. I only had my phone with me, so I tried to take pictures of it with the phone camera. I blew it up as much as possible. The bird was still hard to see. After several days of trying to figure out what it was. I got some better pictures. I also recorded the call. Finally, I identified the bird as a cactus wren, a new bird for my life list. The bird you can hardly see in the center of this picture is a white capped sparrow. I thought it might be my mystery bird. It wasn’t. I guess this one could be entitled “Important Women in This Person’s Life”. 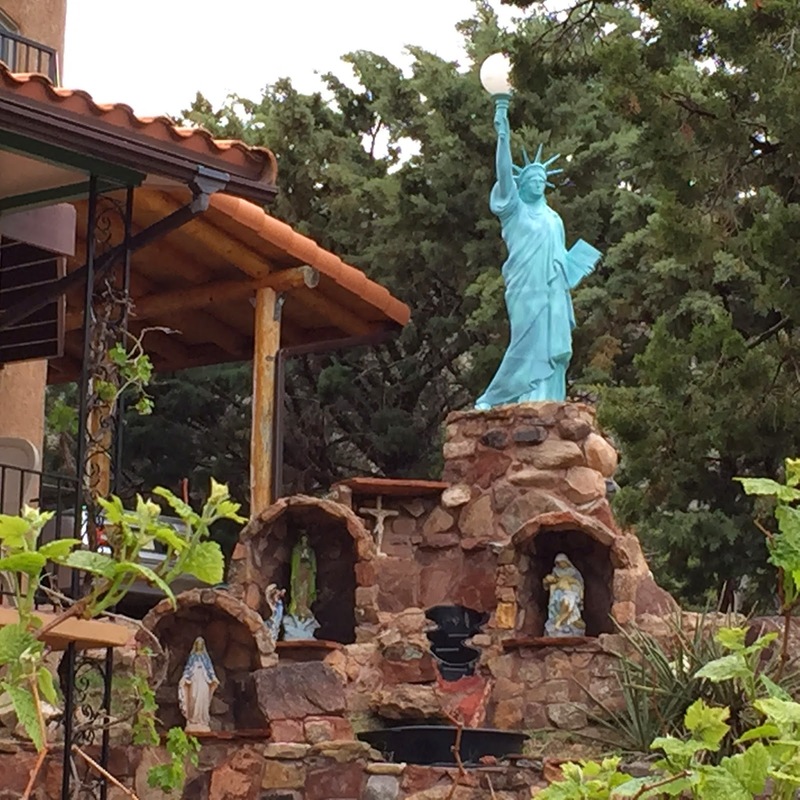 Three madonnas and the Statue of Liberty in a river rock shrine. One of my nieces loves Hello Kitty. I routinely take pictures of things I see with Hello Kitty on them. I could do a whole 365 pictures on just this topic. This odd looking creature is an Earth star. It’s some kind of fungus. The amazing thing is that we found these in the super wet climate of Boone, NC and in the desert of Albuquerque. I don’t know how they can live in both places. You might think this is just a lame couldn’t think of anything else to photograph, but you’d be wrong. These are my new slippers. I love them. It’s kind of hard to see what this is because of the shadows, but it’s the remnants of a fire which someone set by one of the trails in the open space. One of the big fears in the West is of wildfires. This could have become one, but someone was able to put it out before it got out of hand. Crazy. We saw this giant pistachio nut just outside of Alamogordo, NM at a tourist spot. We were on our way to one of Gail’s races in Cloudcroft. I love kitsch like this. This is a very bad picture of the telescope at the National Solar Observatory at Sacramento Peak, NM. The amazing thing is that what you see is only about a third of the instrument. The rest of it (about 220 feet) is underground. I have mixed feelings about this one. Look at the really cool ammonites in stone. They are millions of years old. Now they are decorations surrounding a post on a boardwalk. It’s neat to see them, but it feels almost sacrilegious to me to use them like this. It’s the same feeling I got when going by gravel operations in the Appalachians of Western NC where they were mining rock, which is some of the oldest on earth, to grind into gravel to pave roads and parking lots. It just seems wrong to me. It seems like a long time since I have posted pictures. I was surprised to learn it had only been a week. Neither of these is a great shot, but they both illustrate what I saw on my morning hike. It is very dry here. In town where vegetation is irrigated, plants are in full spring mode. In the open space which is wild high desert, vegetation is taking its sweet time. I saw only a couple of flowers on the first half of my walk, then I saw this Evening Primrose followed by maybe five more blooming plants on the way toward home. Last year at this time, the area was covered with blooms. 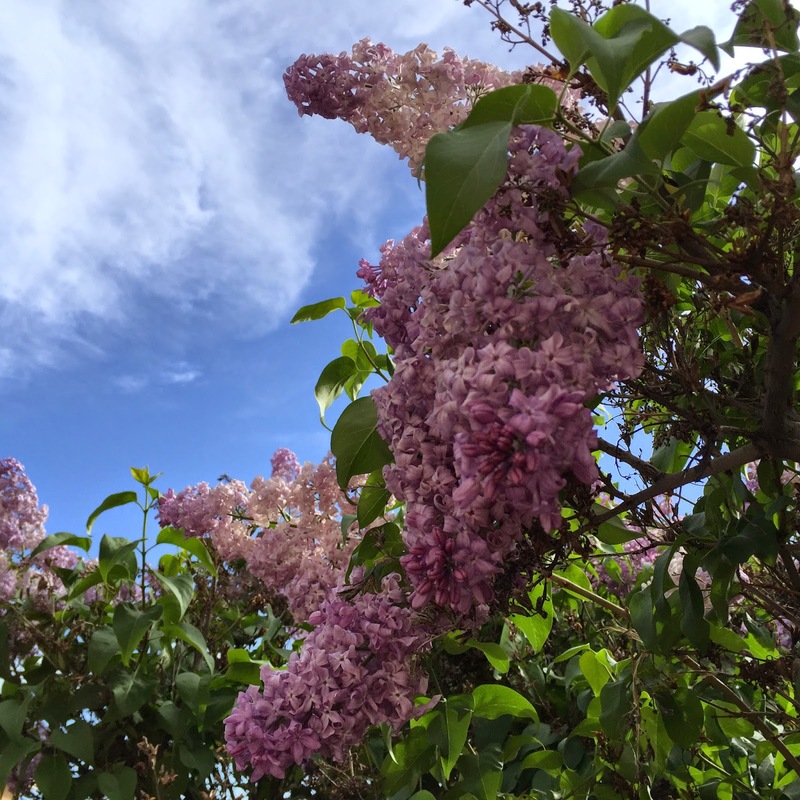 The lilac bush outside our kitchen door illustrates what a difference water makes. These smell wonderful. Continuing with our vegetative theme…This is a plant, which was a gift, was a new one to me. I know Christmas cacti, but this isn’t one. 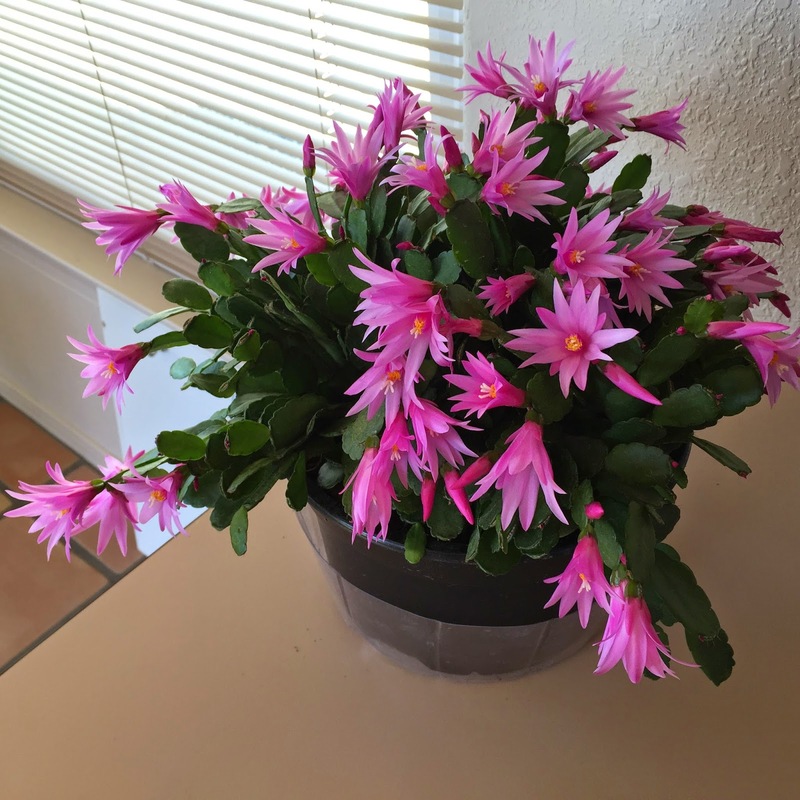 It’s a Spring cactus. Same family, different branch that blooms at different time of year. Another thing which was news to me is that both kinds of cactus are indigenous to tropical forests. A few days later the Open Space is starting to show signs of spring. This prickly pear is starting to put out flower buds. What is spring without baseball? The Rockies are hot right now. They swept the Giants in this series. It seems we are back to flowers. This cholla seems eager to get those flowers blooming. You probably can’t see him, but in the top of the spruce tree on the left, is a spotted tohee singing and singing. We had barely gotten home from Moab, when I headed to Texas to visit my daughter and her family. I took lots of pictures of our youngest grandson as any doating grandmother with a new camera would. So many children are fascinated with their parent’s shoes. Ryker pulled on his dad’s socks and then concentrated on getting his dad’s shoes on and laced. Oh the power of the word. I asked him to stop where he was so I could take his picture. He thought I didn’t want him to come see me. What a sad face. How easily words hurt. How quickly the clouds lift. Texas Hill Country has a mild climate. Things grow there that don’t grow here. I don’t believe I have ever seen amaryllis growing outside. Family photos don’t have to be staid. While waiting for everyone to get into place for the usual family holiday shots, I snapped with one of the group. I think it is the most interesting shot I took. The formations at Canyonlands National Park are part of a vast geological area. Thinking about the ages of the exposed rock and how long it took for the area to become as it is, certainly gives one a different perspective on one’s importance. The one dawn shot I got. Then, my battery gave out. This is a shot of Newspaper Rock. It is one of the most dense collections of petroglyphs I’ve ever seen. The other amazing thing about it is that the idiots that seem determined to crap up all that is old, pristine, unique have pretty much left this alone, even though it is very accessible to the public. It’s March. March means the NCAA Men’s Division I basketball tournament and my annual struggle with being a loyal fan inspite of KU’s determination to play poorly when it counts. At least they weren’t alone this year. The supposedly very strong Big 12 was wiped out early. You can tell it’s afternoon because the dogs are on the couch. 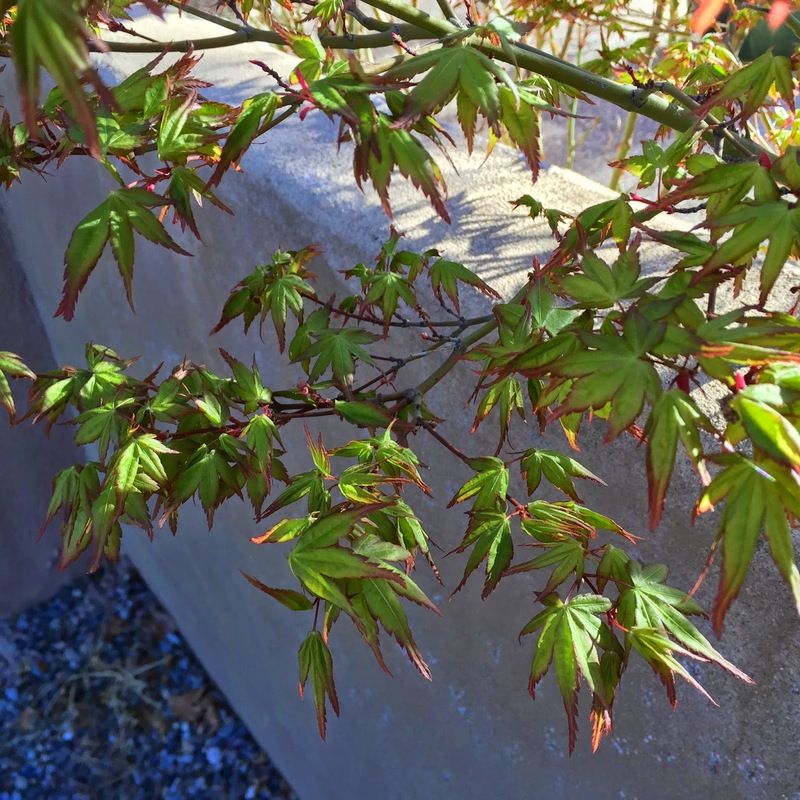 Tiny, just opened leaves on Gary’s Japanese maple. These are the Three Gossips a stone formation in Arches National Park. I took many, many pictures few of which are noteworthy. The light is intense there. We arrive at the park at midmorning this day. Too late for good photography.